First collected in 1932 at Niles, Berrien Co. (P. E. Hebert, ND), and spreading along railroad tracks. A European species. This species resembles B. japonicus in the short anthers, the fine, soft, crooked or matted hairs on the sheaths, and the shortness of the awn of the lowest lemma in a spikelet (less than half as long as the longest awn in the same spikelet). The lemmas of B. japonicus are not over 2.2 mm wide on a side, whereas in B. squarrosus at least the larger ones are 2.5–3.5 mm wide, including a hyaline border that may be as broad as 0.7–1 mm at the prominent angled “shoulder” near the middle of the margin of the lemma. Well-developed mature awns in B. squarrosus spread ± at right angles to the spikelet or are somewhat recurved; in B. japonicus they are seldom so widely spreading. MICHIGAN FLORA ONLINE. A. A. Reznicek, E. G. Voss, & B. S. Walters. February 2011. University of Michigan. Web. 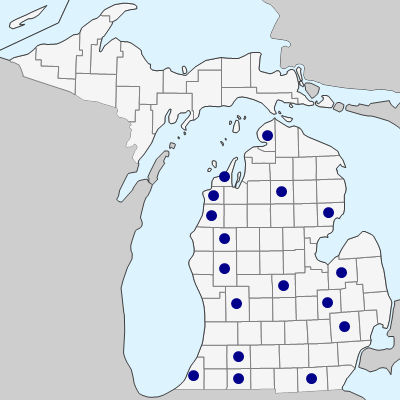 April 21, 2019. https://michiganflora.net/species.aspx?id=2041.